Have you ever moved into a new home and arranged and re-arranged furniture to find it’s best fit? Then you might understand the challenge that sometimes comes with determining how to best use space. In senior living communities, there are even more considerations to take into account that are unique to this industry. 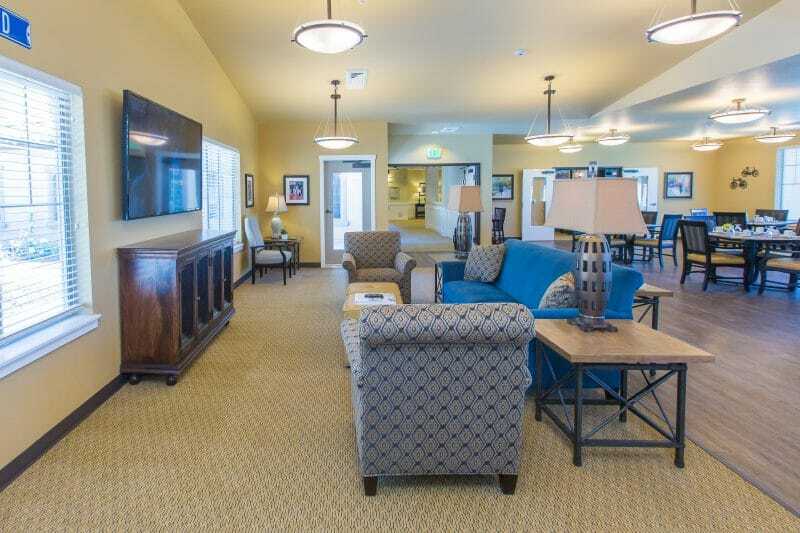 Each senior living community’s interior design plan should strategically make use of space to fit the room and suit the needs of the staff and residents. Some rooms can be used to host similar activities or groups. Identifying rooms that easily lend themselves to serving multiple purposes, and designing them to appropriately do so, can allow a community to provide more options and amenities within its existing space. For example, rather than having a dedicated library and a separate dedicated game room, one space may accommodate both, as both may have darker woods and a similar feel. Another great dual purpose room is a theater room. If it is designed with chairs with tablet arms, it can serve as a movie room for residents, and a training room with screen projections and note-taking tables for staff. Not all rooms should be multi-use. Sometimes it is important that a room or area serve only one purpose, and is therefore designed to identify as its own unique space. Interior designers can evaluate which rooms should have one dedicated purpose, and can be combined, in order to minimize the cost of square footage and best utilize the space. In rooms that are used for a wide variety of activities, staff often find themselves shifting and moving furniture. For example, when a community room turns into a dance hall for the night, or is rearranged to include with more chairs and seating for a presentation or performance. As you can imagine, this shifting and moving of furniture can be difficult and frustrating, especially if it occurs regularly! We recommend using lightweight furniture options to allow staff to more quickly and easily adapt the room to the current needs. People normally have a tendency to put furniture against walls rather than “floating” in a room. But in certain instances, floating furniture can be strategically used to divide up rooms spatially. For example, one large common room may have the appearance of being broken into several smaller, defined “rooms” by the position of the furniture rather than by walls structure. This becomes a more efficient use of space should changes be needed in the future, as it is easier to make changes to furniture than walls. It is also a more efficient strategy for stimulating conversation, especially with people with lower hearing levels, as the furniture arrangement makes it easier to converse and socialize. Is your community looking for ways to make better use of space, or planning to undergo a re-design? Contact Warner Design Associates to discuss how we may be able to utilize our expertise in senior living interior design to find the best solution for your community.